The ship had docked at a popular place called In-Orbit Mall. Me crew was looking for a nice place to eat grub at. Suddenly, one of the mateys spotted a winner. The restaurant towered above the rest like a lighthouse guiding the ships at sea. I smiled as we marched towards it rubbing my hands in glee. Indian people are often accustomed to stereotypes of food. When we hear of Pizza, the first thing to hit the mind is the factory grade pizza served at Pizza hut or Dominoes. Do note, the so called big chains serve Indians with crass pizzas which would not even make it to the plates of an American customer. The pasta is usually tossed and wrapped in Arrabbiata sauce. It's surprisingly easy to make this at home. Is the gourmet standard gone? Well thankfully there is nothing to worry, as gourmet restaurants have been opening up in dozens all around Indian metros. One can thank the Masterchef culture, the new hospitality buzz and Indians touring abroad for the changes. Indigo Delicatessen is among Mumbai's top notch restaurants. It has six branches across Mumbai at the time of writing this post. I chose the Malad West outlet for conveyance reasons. It is the easiest to reach from my place. There is a belief amongst suburbanites that the suburbs are often treated badly as compared to main Mumbai. This belief is true to a large extent. The suburban McDonalds, KFCs and Pizza huts serve food so horrendous that it deserves to be in a trash can and not inside a person's stomach. Indigo is different. It's quality remains the same, regardless of the location. At least to me. The food, service and ambiance of the Malad branch is no less than its swanky uppity siblings in downtown Mumbai.The restaurant size is small but its bigger than a cafe. The crowd in here is quiet and sophisticated as opposed to the noisy shopping crowd outside. There is a sense of serenity and the restaurant provides a much needed sanctuary from the unwanted chaos of the mall. The lighting is ideal. 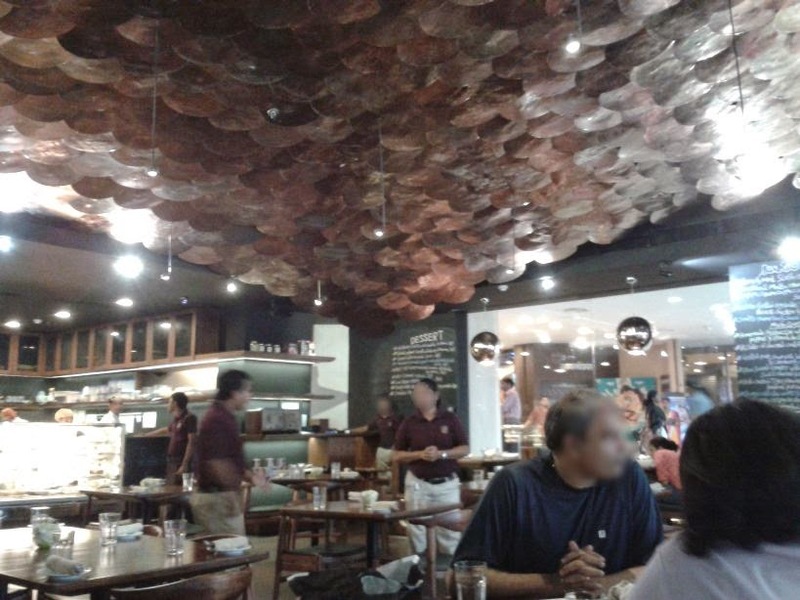 The ceiling which is typical of all Indigo restaurants, provides an interesting color to the ambiance. Crew mate: Captain the lighting feels coppery. Captain : That is true lad. But it be a fine place to dine. That I do agree. There are two types of seats in here. The typical chair-tables and the Sofa chair-tables. I preferred the latter because hey, I am here to relax. Regular chairs are um...boring. The sofa chairs are limited though. During peak hours, it may be difficult to get one. For my trips here so far, I have dropped in at non peak hours thus finding a comfy sofa seat each time. The service is quite good. Although, one may occasionally find that the server is a little less informed about the food on the menu. Thank God for smartphones and Google which provide instant pictures and descriptions of the said items. All said and done the servers are polite, polished and professional. The three P's that matter. From time to time, a Captain will ask you about the food's quality. If you are not impressed then you are free to unleash your storm on him. There was a time when this restaurant had received a lot of negative feedback and it sincerely worked on improving itself. A restaurant which follows the policy of asking the customer about the food and providing feedback cards usually comes off as a place which is constantly improving. Such places are always more welcome than the "Don't give a damn" places like McDonalds or KFCs. Crewmate : Captain, I be lost. Such a big menu. It is as big as the sea. Captain : You have always been the thick one. Show me the menu and I will tell what we can order. Captain : Shiver me timbers! This is indeed confusing. The food offered is quite diverse. It is easy to get lost. So many things to eat but you can only order a few things per trip. Italian seems to be the dominant cuisine although the menu does offer a fair amount of continental grub. Let me write about the food that I have eaten in my trips so far. BBQ Pizza on a wafer thin base. Was the thinnest pizza base that I have ever came across. Thin bases are usually healthy and feel less heavy as compared to the traditional pizzas. This was a true gourmet pizza and tasted exemplary. Despite the thin base, the generous amount of toppings were layered with precision. The pizza had several layers of taste which combined together to form a composite flavor best described as, "Yo, This is totally out of this world." Left me licking my fingers. The cheese used was tasty, slightly sweet and of pristine quality. The chicken was succulent, of the right size(neither too minced nor lumpy) and had a captivating aroma. One would start feeling hungry with the aroma itself. No need for appetizers. Pizzas like these make us realize that Pizza hut and Dominoes have been serving us with cardboard and trash toppings for all these years. If you have a pizza craving, Indigo makes a good choice. The only problem with the pizza selection is that it is probably one of the less diverse options. There are only three pizza options for carnivores. 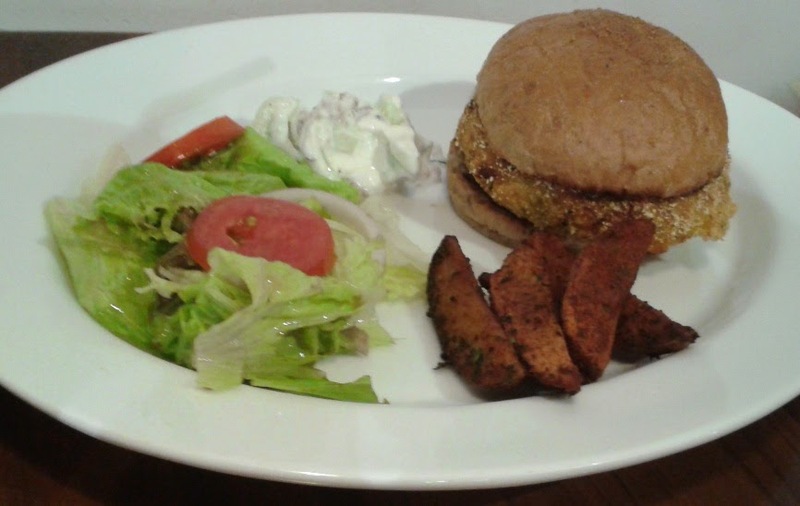 Crispy Chicken Burger with Cucumber Slaw. Indigo's Gourmet burgers are several hundred times better than the abominable stuff served in McDonalds. This is a whopper loaded with juicy chicken pieces. Yes, there is more to it than that Patty in the picture.While the slaw wasn't that great, the burger was quite exceptional. Its size would humble the so called Big Mac. The potato wedges appeared well cooked but yet weren't oily. I suspect that they were baked. The herb coating added to their flavor. The burger and its sauces were extremely satisfying. Crispy, juicy - a lot going on over here. 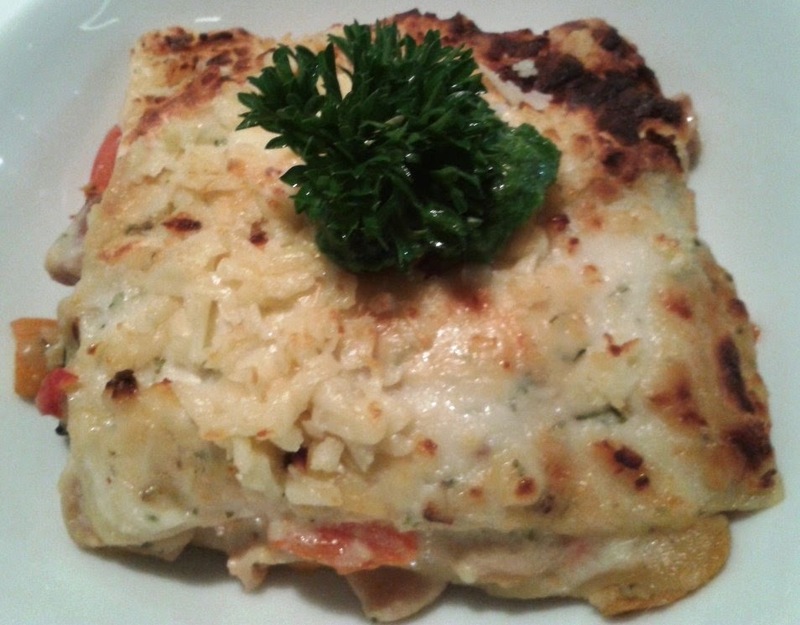 Chicken Lasagne. Lasagna is one of my favorite Italian foods. It is also one of the least known Italian foods in India. Very few know that its actually a kind of pasta. However, its presentation and preparation does make it taste distinctively different from generic pasta. 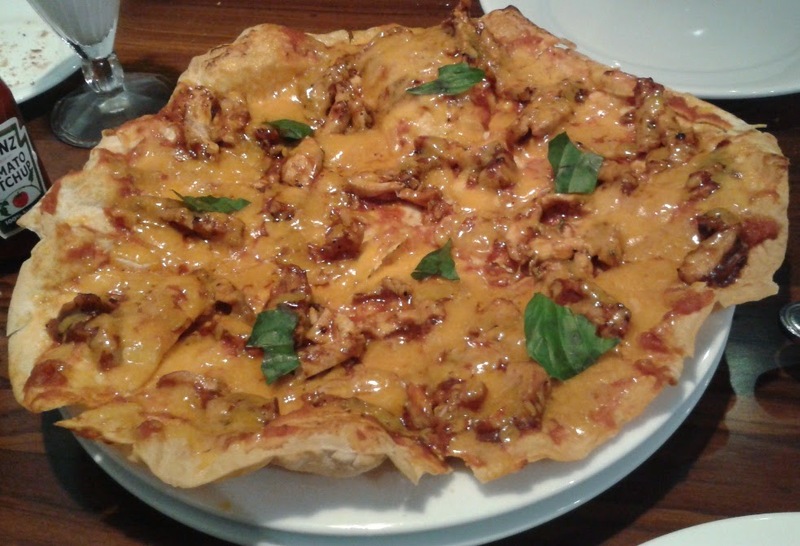 Indigo's lasagne may be a bit dull on the presentation but the taste is another story. The large number of lasagna sheets and the minced chicken can leave you asking for more. The subtle presence of herbs which tend to play hide and seek with your tongue is well appreciated. The sauces are tangy and savory both at the same time. I am not entirely sure but I felt that it had both Mozzarella and Ricotta. Potato Fries. Light, almost non oily potato fries. 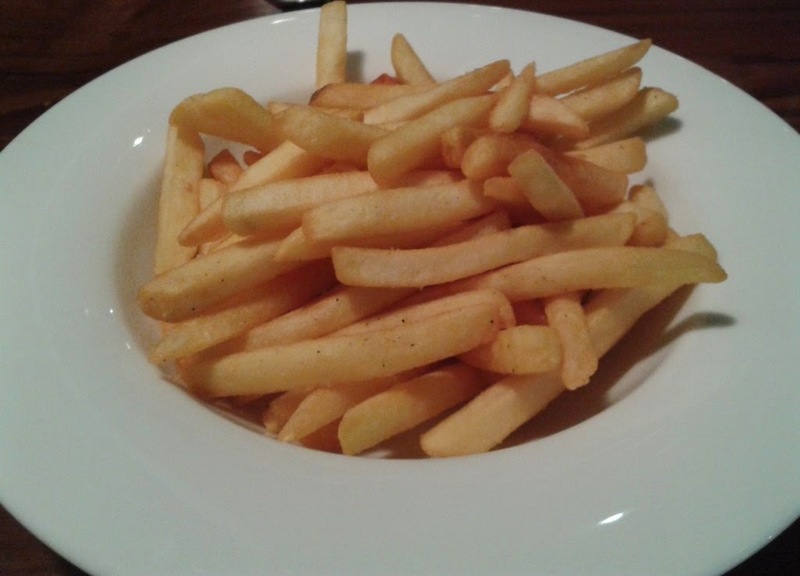 The fries had a beautiful texture and complemented the food very nicely. They tasted fresh and had flavor unlike the hay we are served at most fry outlets. I'd say that these were some of the best fries served in Mumbai. 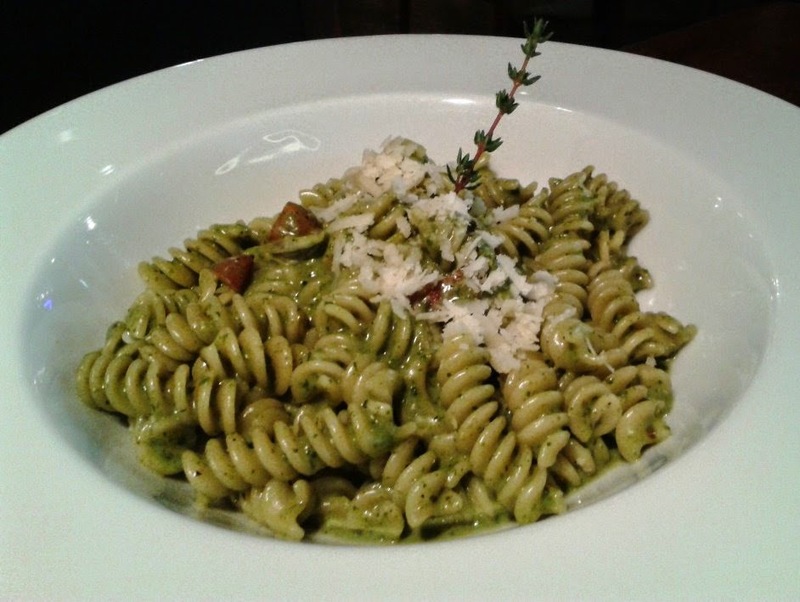 Fusilli with Green Pesto Sauce. I would embarrassingly admit that this was my first encounter with pesto sauce. Being accustomed to eating pasta la arrabiata style every time when I have a pasta craving, this was certainly a new experience for me. Despite being a vegetarian item, I must admit that it impressed me - a carnivore quite well. The pesto sauce going by Indigo's yardstick must have been of good quality. It sure tasted nice. The soft Fusilli had blended well with the pesto sauce. Yeah, it was truly something. The herbs and the pesto tasted heavenly. My imagination was sent on a high, probably due to the basil in pesto. I was sitting on a bed of clouds with a bowl of green pasta. It was without a shred of doubt, the best pasta I have ever had. A bit of Basil, a bit of bitter pine nuts and a lot of savory herbs. If you have never had pesto before then Indigo is an ideal choice for you. Captain: Pasta! Green! What in the world is this? Crewmate: om num nom ohhh. Captain: What's wrong with you? Let me have a taste. Indigo has a wide range of desserts and thus in my view its a winner. A restaurant that serves a large number of quality desserts is the best. Mousses, Cheesecakes, Crème Brulee, mud cakes brownies...I could go on and on. 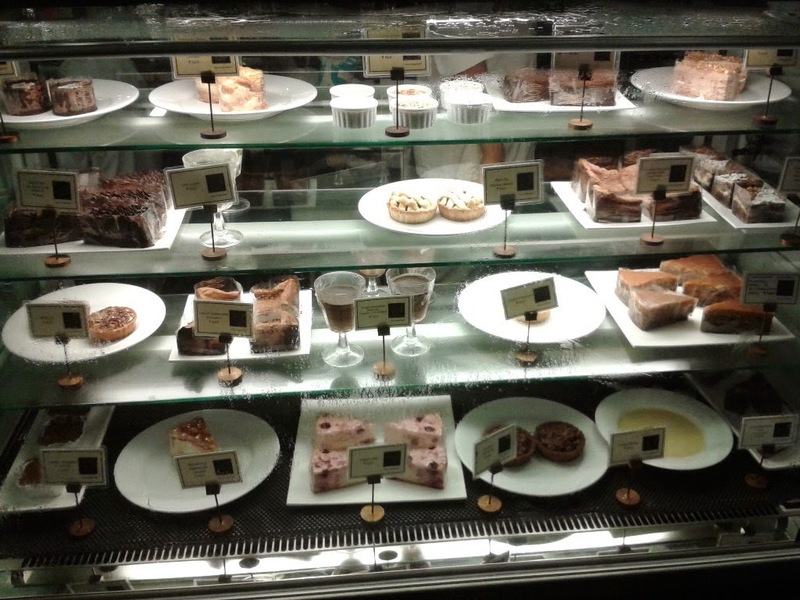 If the names alone don't impress, one could always walk to the dessert display case and have a look themselves. For a cheesecake lover like myself, I almost swooned with what they had on offering. 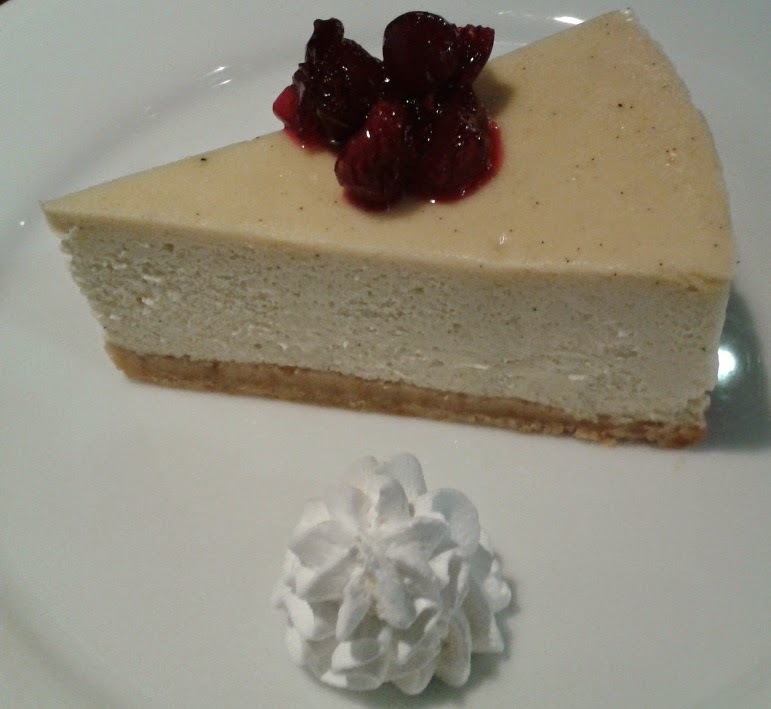 The Vanilla cheesecake with cranberry sauce was a traditional baked cheesecake with a little bit of Cranberry sauce. While the cheesecake base was addicting, I am afraid that I will have to favor the cherry flavored cheesecake below. It was one of the best cheesecake variants that I have ever had. The cheesecake was truly cherry flavored and not simply topped with cherry sauce. 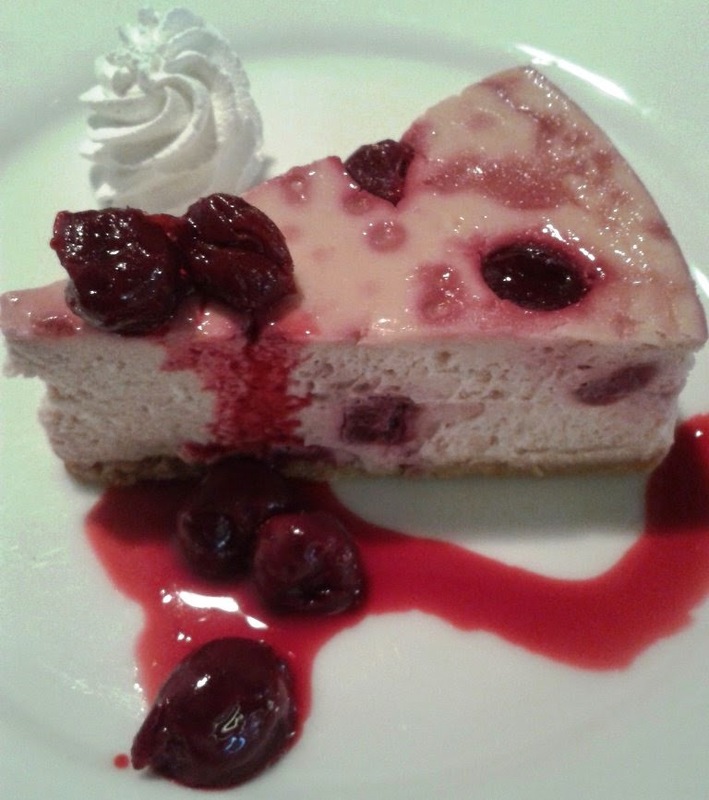 The tangy taste of the cherries coupled with the rich flavor of the cheesecake was an otherworldly divine sensation. This item alone has enough power to lure me again to Indigo. Sadly, the Cherry flavored cheesecake is not available everyday. Indigo has a policy of rotating cheesecakes every day. So, its only available every once in a while. Concluding, I will say that Indigo was a memorable experience for me. The pricing was a bit of a dampener but the food completely lives up to it. It is easy to get a huge tab over here, mind you. Nice food, peaceful ambiance and excellent service. "All Hands on Deck! Time to move out lads. Until next time."